Participants of the European Physical Society energy meeting hosted by F4E. 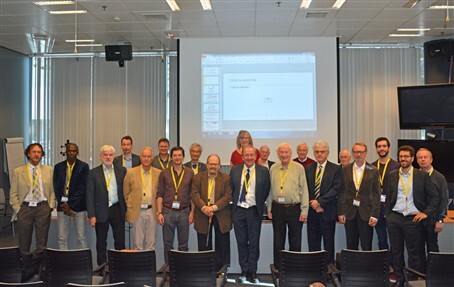 With an obvious and keen interest for European and global energy production issues, F4E hosted the annual Energy Group Meeting of the European Physical Society (EPS) at its Barcelona headquarters during 4-5 October. Gathering 25 participants from 15 countries all over the world, the purpose of the meeting was to exchange knowledge and give an overview of energy-related topics. The two-day meeting was opened by F4E Director, Johannes Schwemmer, who welcomed the participants and highlighted the importance of the topics discussed within the general context of energy production after 2050. Presentations about wind energy, nuclear power, integrated energy systems and sustainable development were held by members of the European Physical Society. This was followed by presentations about the status of energy developments in various EU countries, future energy developments, as well as climate change and climate modelling. Analysis also showed the challenges ahead regarding the achieving zero CO2 emissions by using only solar and wind energy. During the second day, the guest speakers Professor Richard Lindzen from MIT and Professor Paul Williams from Reading University shared their different expert views on anthropogenic causes related to climate change, thus generating a lively and interesting discussion amongst the meeting participants. The EPS is a non-profit association whose members include 42 National Physical Societies in Europe, individuals from all fields of physics, and European research institutions. The EPS engages in activities that strengthen ties among the physicists in Europe. As a federation of National Physical Societies, the EPS studies issues of concern to all European countries relating to physics research, science policy and education.